Nothing says fall like a fresh crisp New York State apple. Last weekend my family and I officially commemorated fall by picking fresh galas, granny smiths, and more (with names I can’t recall) at Green Acre Farms in Greece, NY. The off and on rain didn’t deter us and we had fun bonding, picking and running from the bees. Pictures on that visit coming on Monday’s week end round up. 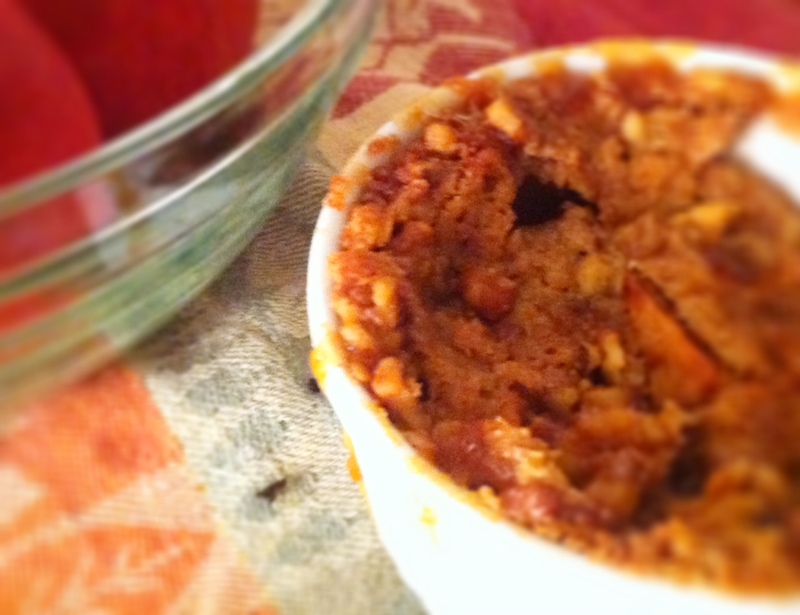 Until then I’m sharing my simple and A+mazing Apple Blueberry Crisp recipe initially published in my cookbook: Cooking with Fibromyalgia. What’s your favorite apple variety? Let me know. 2. In a food processor, pulse all ingredients for crumb topping, and transfer to a small mixing bowl. Set aside. 3. In a medium mixing bowl, add apples, blueberries, water, fruit juice, lemon juice, brown sugar, cane sugar, vanilla, and cinnamon. Mix ingredients well. 4. Divide apple filling mixture between 4 ramekin dishes and set each on a cookie sheet. 5. Top filling with crumb topping, and place in oven for 20–25 minutes until top is golden and filling is bubbly. 6. Allow ramekin desserts to cool for at least 10 minutes before serving à la mode.